Sixteen Northern Bridge DTP doctoral students, drawn from across the Arts and Humanities, spent a week at the BSR on the second such residential partnership programme, which is put together between BSR staff and fellows and Northern Bridge academics. Northern Bridge is a consortium made up of Newcastle, Durham and Queen’s Belfast universities to support and fund the best PhD research in the North East of England and Northern Ireland. The aim was for the students to engage with a series of case studies in advanced research, and to be enriched by that most powerful of things, time in the BSR’s interdisciplinary environment to chew over ideas with one another and the BSR’s fellows in residence. Stephen Milner [BSR Director] offered a warm welcome to the group and delivered an outstanding and wide-ranging session, covering current HEI and BIRI [British International Research Institutions] policy, thinking about careers, and the bioarchaeology of the book, an exemplar of the kind of interdisciplinary thinking we sought to showcase in the programme. Stephen’s comments underscored the depth of the BSR’s commitment to engaging across the research community and reminded all present of just how much the BSR does and can continue to do to support cutting edge work across the Arts, Humanities and Social Sciences. Our wonderful cohort contained students from many fields not normally represented at the BSR, but from the moment they arrived on Monday morning, they soon found themselves at home. Our first trip out of the BSR was to the Venerable English College, a visit organised and facilitated by BSR Research Fellow Professor Maurice Whitehead, exploring the astonishing history of the college, its library, students, buildings (including the glorious chapels and most importantly its collection of rare books and archives). Niccolò Mugnai leads a visit to the Forum and Trajan’s Markets. 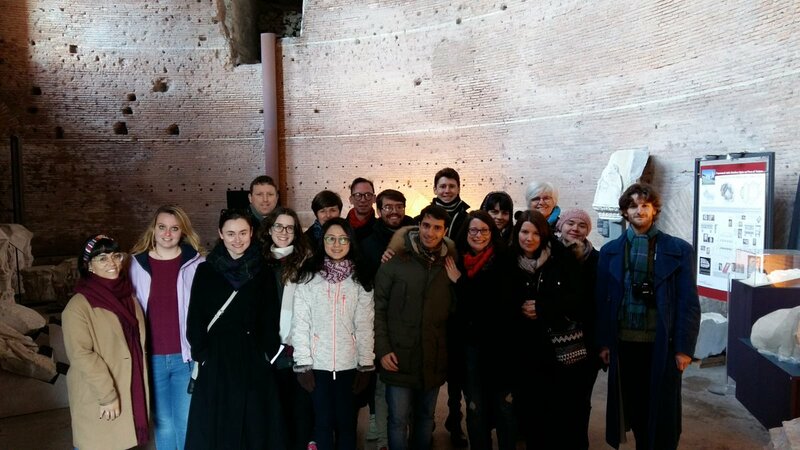 Dr Niccolò Mugnai, another BSR Research Fellow, led a perfectly pitched tour of the Roman Forum and Trajan’s Markets, and the students were able to understand the archaeology and topography of the site from a real expert, as well as enjoy some sunshine. This followed a trip beneath the Lateran Basilica in which Professor Ian Haynes sought to explore not just the subterranean world of Rome, but also the potential of Digital Humanities. The students were wowed by the scale of the site and its obvious importance, and were able to think about the benefits of interdisciplinary and international research. One of the students’ favourite sessions on object-based learning was run by two of the Assistant Directors, Martina Caruso and Harriet O’Neill. After a presentation from Valerie Scott [Librarian] and Alessandra Giovenco [Archivist] , the students were put into small groups, encouraged to select an object, image or text and work together to write a museum label for it, thinking about how to work collaboratively to express their research to a general audience. Alessandra Giovenco with students looking at objects from the Library and Archive. Given the strength of the BSR and the richness of research in creative practice, we were keen to expose attendees to work in this area. Accordingly, Martina Caruso kindly arranged for a special tour of the BSR’s studios, with artists in residence outlining how they were setting about their projects. The session was a resounding success. Studio visit with Abbey Fellow in Painting Dillwyn Smith. One of the strengths of the programme is the way in which, as well as exposing students to the cutting-edge research being done in the BSR and by its fellows, Northern Bridge academics can also take part and lead sessions. So, the Northern Bridge director, Dr Annie Tindley, led a session around Britain’s nineteenth-century relationship to Roman imperial history. Dr Jon Quayle, a veteran from the 2018 residential and a superb addition to the team, was able to draw on his own experience both as researcher in residence at the Keats Shelley House and as an early career scholar whose PhD was funded by the AHRC to help raise students’ awareness of its holdings. The whole group spent a morning at the museum and were joined by the Curator, Giuseppe Albano, in a fascinating presentation. Professor Crawford Gribben, the Queen’s academic director for Northern Bridge, led a brilliant session exploring puritan apocalyptic visions of Rome through time, a session that folded beautifully into the visit to the Venerable English College. When not fully engaged in this rich programme, the students were divided randomly into two teams, and were given time over the week to discuss their reactions and responses to the programme, the BSR and of course to Rome. Using the fine library resources of the BSR, their own skills and imagination, the students are to deliver projects on a theme of their choice on the topic of ‘UK and Italy’ to their peers at the Northern Bridge Summer Conference in June. They presented these as works in progress on the final evening, with one group exploring the creation of a ‘Museum of Curiosities’ to house their memories of the programme, with the other working on creating a photo archive on the idea of spolia, a theme which recurred over the course of the week. Northern Bridge DTP students in the BSR courtyard. While there are always lessons to be learnt, the unanimous conclusion of all who participated was that this was one of the most exciting, energising and fruitful experiences of their research careers. Planning is already underway for next year’s event. This entry was posted in Uncategorized by britishschoolatrome. Bookmark the permalink.